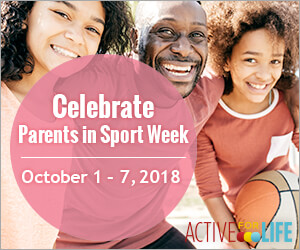 Parents in Sport Week is an opportunity to celebrate the tremendously valuable role that parents play in sport. From driving kids to practices and games, preparing team snacks, organizing events, and providing a listening and supportive ear, parents play an essential role in supporting children in sport. For coaches and clubs, Parents in Sport Week is a reminder to inform and involve parents and to build a positive environment where kids, coaches, and parents can thrive. To promote Parent in Sport Week, check out the Active for Life Toolkit Page. Parents in sport resources are also available.